Yahoo has announced that users can now access their Gmail and Google Apps account right from within the company's Yahoo Mail service. The ability to connect to Outlook.com, Hotmail, and AOL Mail accounts was already introduced a couple of months ago. 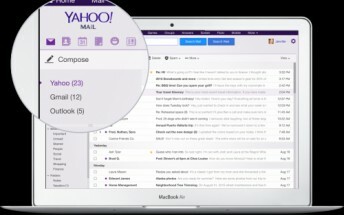 "All the features you need and love in Yahoo Mail – powerful search, smart contacts, rich compose features and Yahoo Account Key for password-free sign-in – are now available with Gmail," the company said in a blog post. "You can now search across your entire history of emails, from day one, for all connected mailboxes! (Not just your most recent emails, which is how it’s done in many apps today)." You can connect to your Gmail account by heading to your Account Settings in the Yahoo Mail app. The new feature is now live, and is available on Yahoo Mail's Android, iOS, as well as the Web app.